Reviving the PC1 | Enide! On this page you'll find pictures, videos and short descriptions of my adventures with a 30 year old Olivetti Prodest PC1. 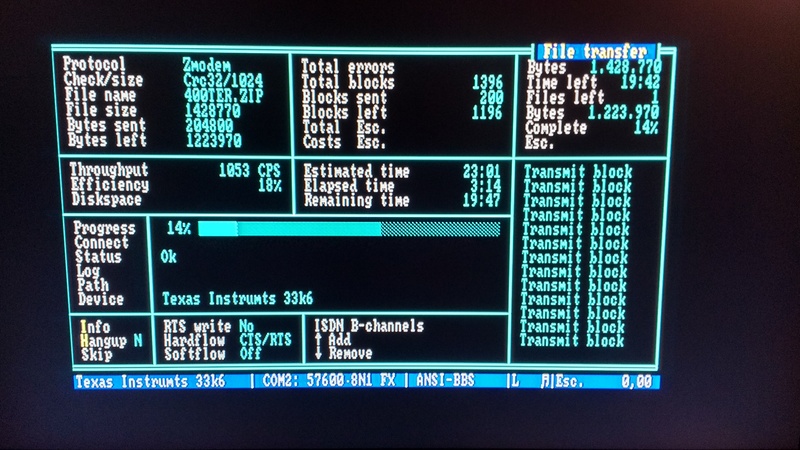 The PC1 I own is a XT style computer with a single floppy with 512KB of RAM and no hard drive. 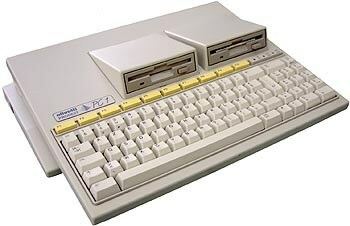 There were two other models, one with dual floppy drives and the best one with a floppy and hard drive. 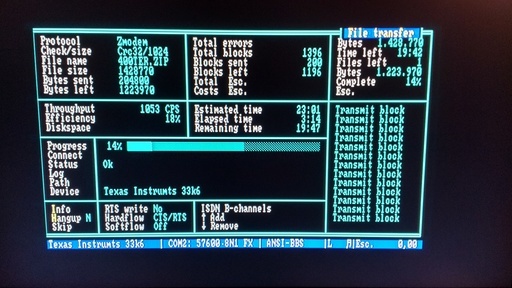 This was one of the computers available in my school when I was somewhat younger. This is the real computer and box. 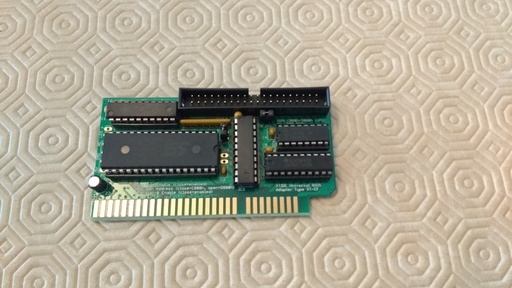 It arrived packaged inside its original box but without the mouse. 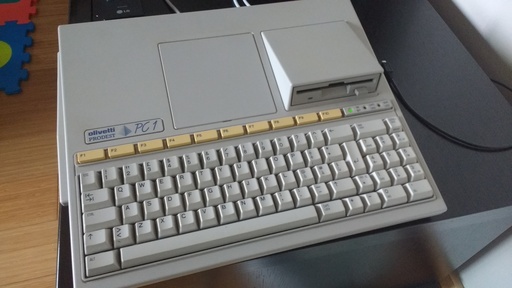 The box is in quite good condition, for a 30 year old piece of cardboard and contains all parts needed to properly seat the PC1 inside. 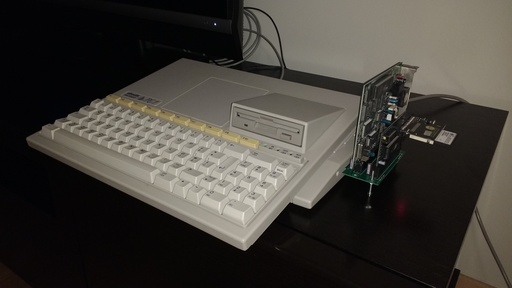 The PC1 itself is in mint condition. The plastics are all clean and no not show any signs of yellowing so I guess the former owner gave the unit a retr0bright treatment sometime before selling it. 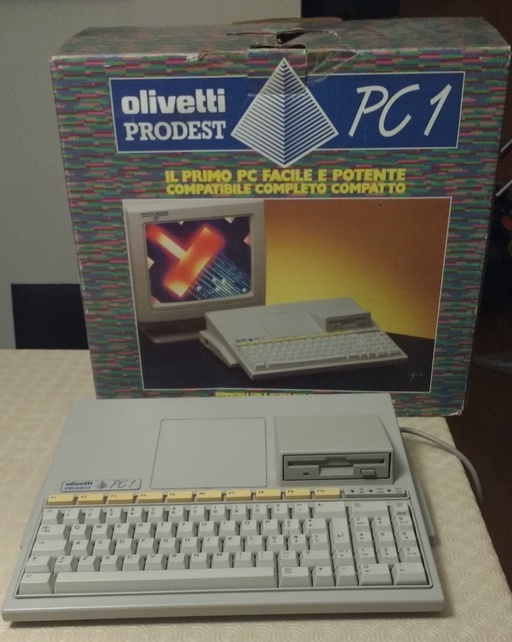 Here's the PC1 ready to boot MSDOS 3.2, Italian version. Everything works fine, except some other floppy with bad sectors or probably some bits of dust on its disk surface. 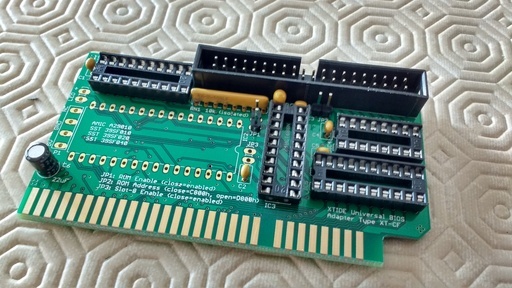 Pitcure of the motherboard. 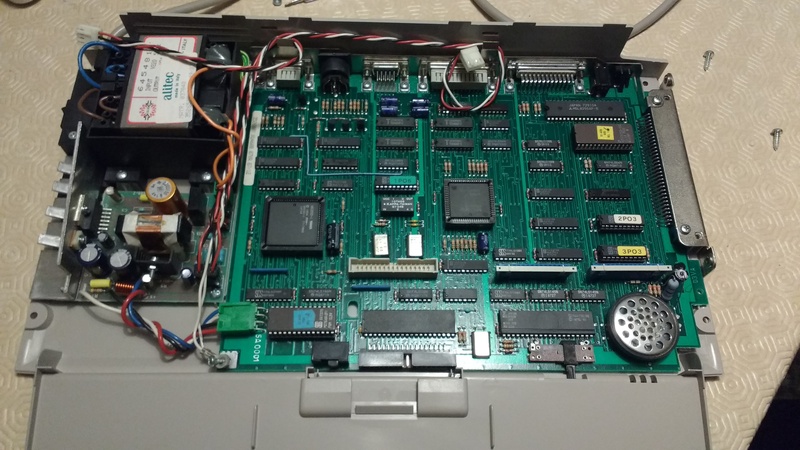 Yes I had to open it to look at the MB and to fix the volume sliding potentiometer, at the bottom right side of the picture, that was being forced agains the case plastic. 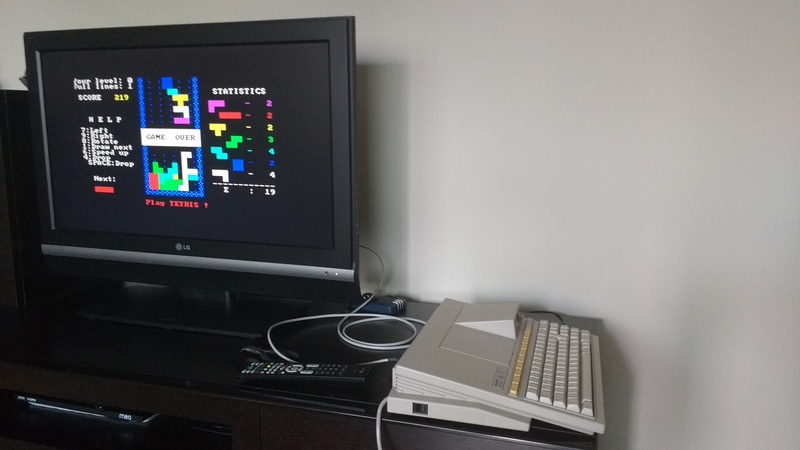 And guess what, Tetris runs fine. 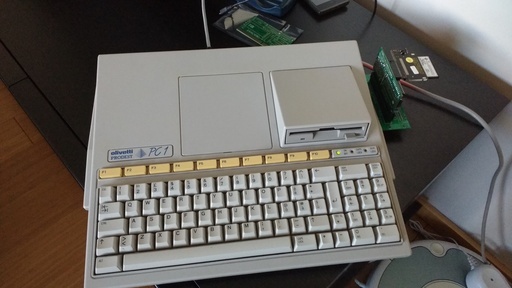 Using floppies was never a great experience. They tend to fail after being used for a while, so the PC1 needs a hard drive or another similar form of storage. I found the XT-CF card perfect for this job because it uses a compact flash card as an IDE hard drive and connects to an ISA slot. And the adapter, bought from a chinese seller online, to connect a compact flash card to XT-CF. 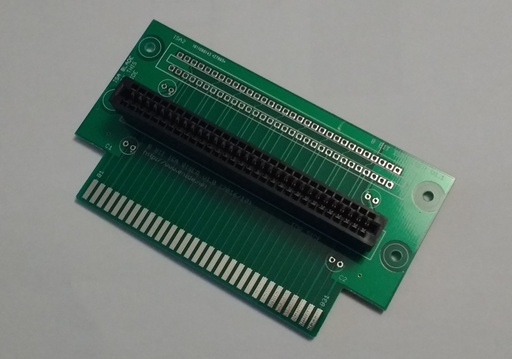 The only requirement is that pin 20 on the adapter card, which is usually removed on regular cables, connects to +5V to power the compact flash card. 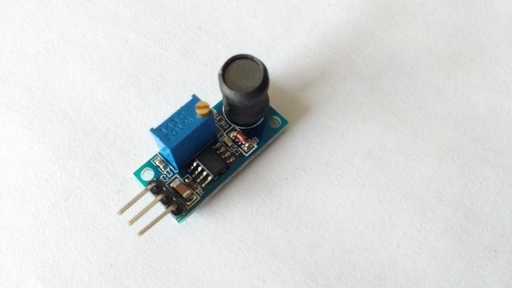 The XT-CF provides +5V on pin 20. 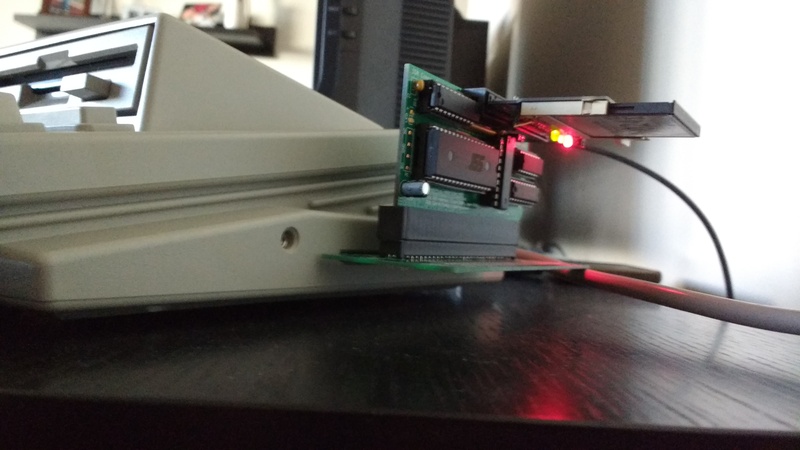 But of course I need an ISA riser to plug it into the PC1 because the expansion slot of the PC1 has its pins quite recessed inside the chassis. 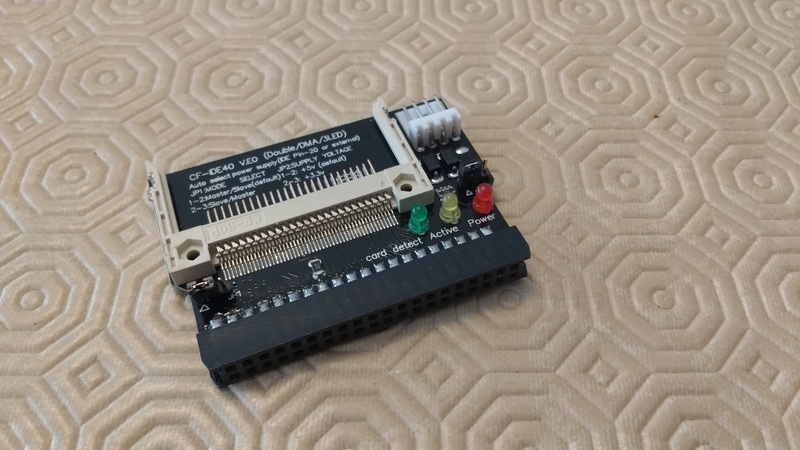 It's 2017, there are no ISA risers anywhere. Even on ebay the few that are available are 16 bit ISA risers for AT machines, not like the original XT ISA 8 bit bus. Solution: make one myself. These are the PCBs as they arrived from dirtypcbs.com (you can order them on this link). I decided to design it with 2 ISA sockets. Time will tell if I need more. 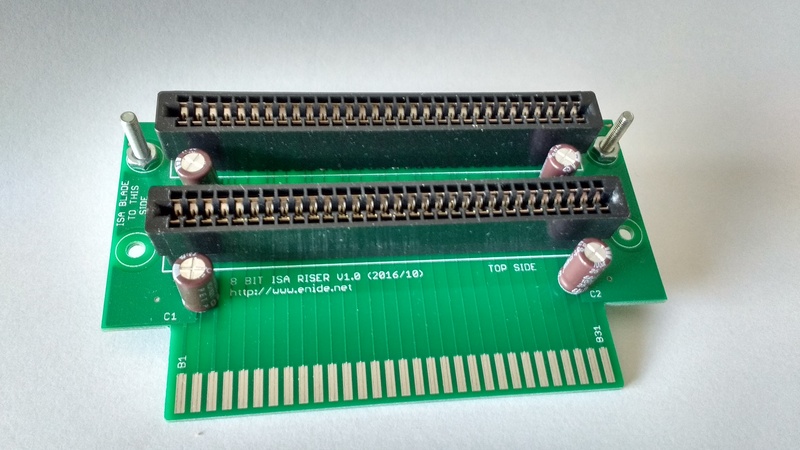 The 8 bit ISA sockets... 31x2 pins with 2.54mm (0.1") pin spacing. ISA riser card after soldering the first socket. 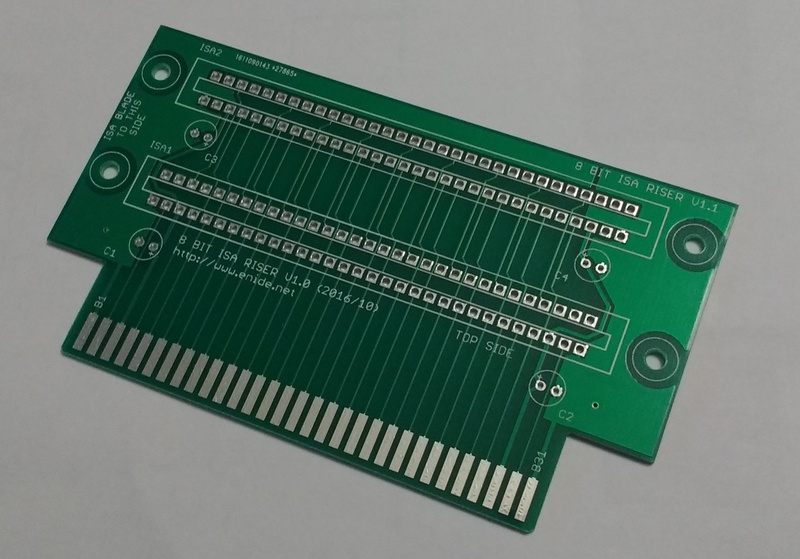 And a close-up shot of the two screws at the back holes to increase the mechanical stability of the board and prevent it from bending due to the weight of the expansion cards. 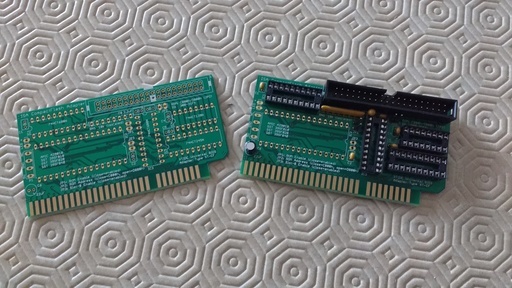 Having assembled one unit of both ISA riser and the XT-CF cards this is how they look together. 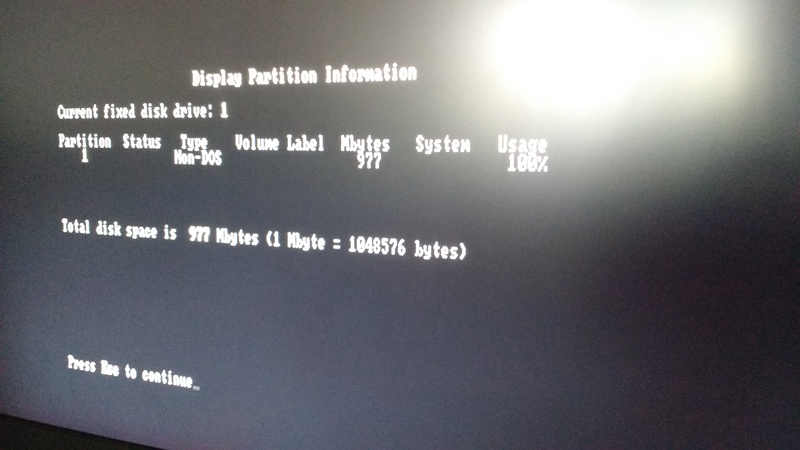 And a screenshot of fdisk partitioning the compact flash card. Got an old modem card to test on the PC1. 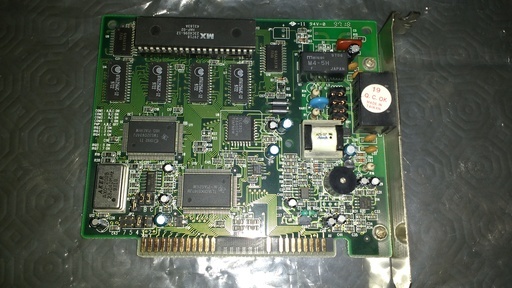 Its a V.34+ modem model 1433VQH-X with a Texas Instruments chipset. 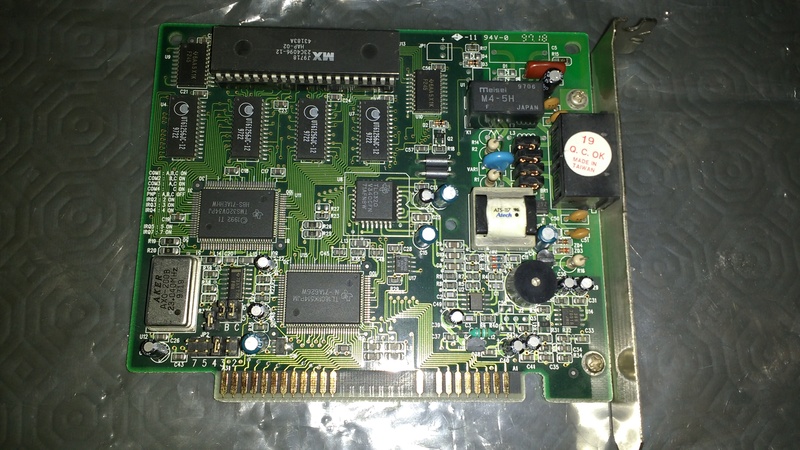 It's capable of speeds up to 33.6Kbit/s and was manufactured 10 years after the PC1 was released. And testing it on the phone line FAILED... it goes off hook but does not dial or even detects ringing when a call comes in. 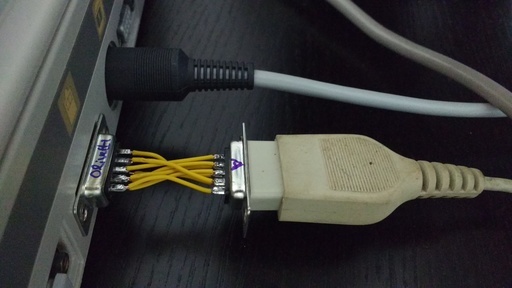 So it seemed the modem line interface was toasted. Maybe I can fix it! 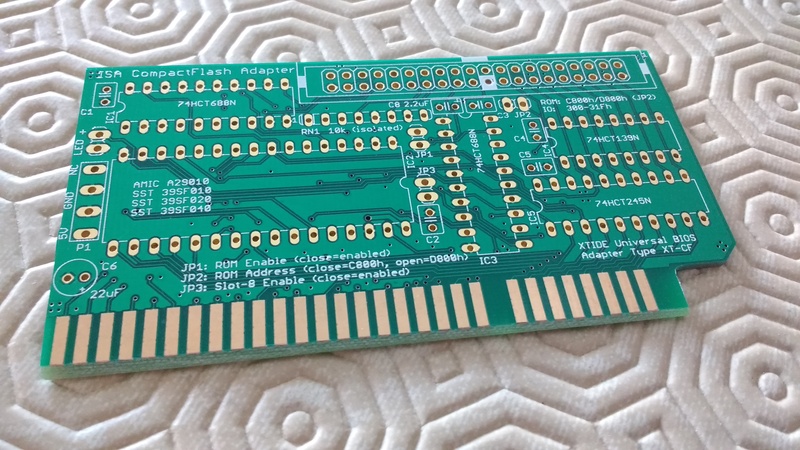 Turns out, after several minutes inspecting the modem line interface circuit, that it needs -12V on pin B7 of the ISA slot. The PC1 doesn't provide this line among several others so I need to provide -12V on pin B7 and test again. My lab power supply can provide -12V if I reverse the cables, i.e. connecting the red cable (+) to the GND on PC1 (pin B1) and the black cable (-) to the -12V line on the PC1 (pin B7). 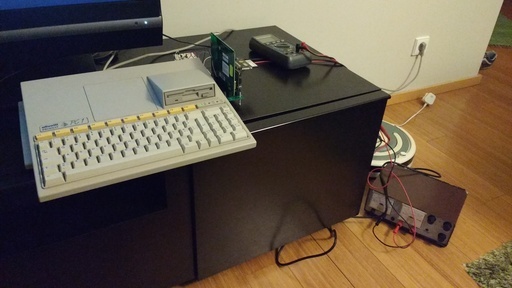 The result is a modem in perfect working condition. The upload speed is not impressive but it works. 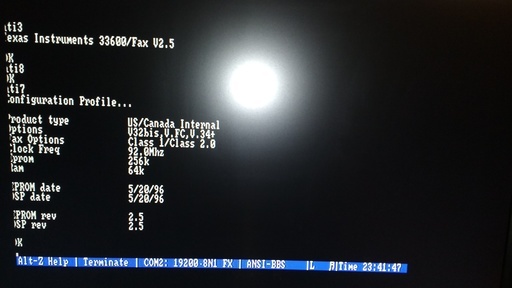 At the other end I have a Zoom V.34 28.8Kbit/s modem. 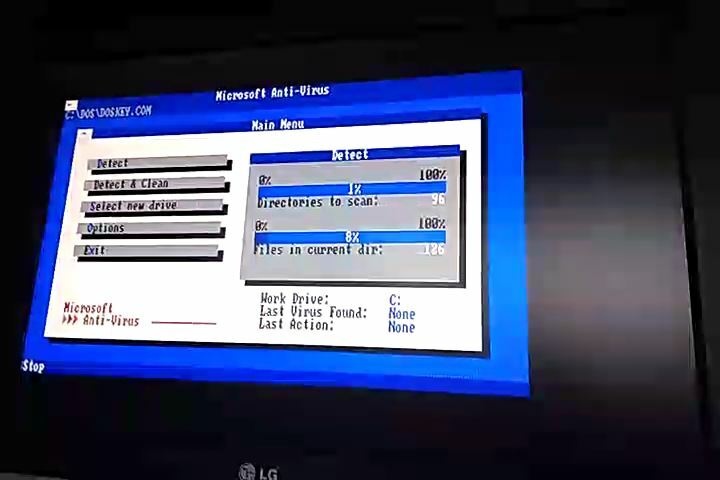 Video of the modem dialing and connecting to the other modem. Instead of making my own -12V voltage inverter I bought a ready made small board based on a 34063 switching regulator from a known chinese online shop. It works very well but whoever designed it forgot to include the output filtering capacitor. The filtering capacitor must be added to the regulator at the output pin or the ripple voltage will be huge, around 1Vpp with no load. 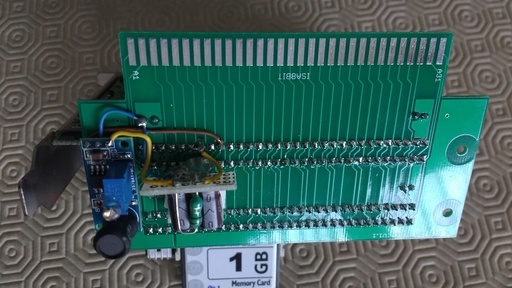 I tested it with a 100uF capacitor and a 390 Ohm resistor to draw 30mA and still the ripple was too high. 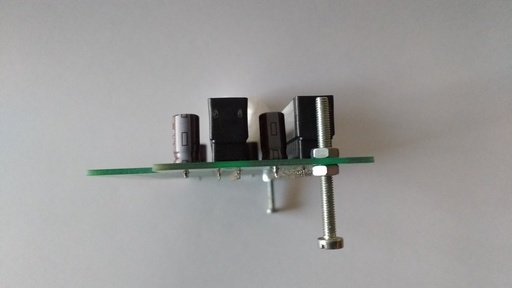 Adding extra filtering with a 1uH inductor and another 100uF capacitor reduced the ripple to a safe value of 30mVpp. 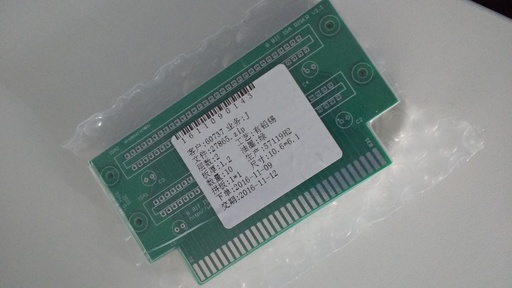 The input voltage comes from pin B9 (+12V) and the negative voltage (-12V) goes to pin B7 after passing through the filter. 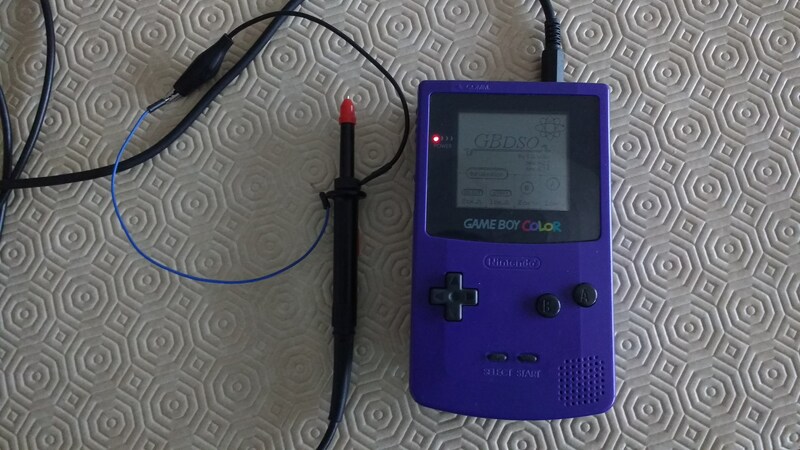 To measure the ripple voltage I used the old GBDSO card on a gameboy color. 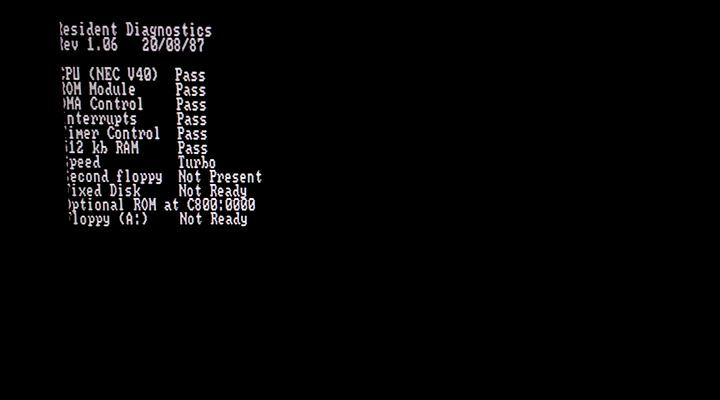 Here's a short video of the PC1 transfering files via ZModem on Terminate 4.0. For some reason the maximum speed if 1KB/s, about 30% of the maximum allowed by the modems... 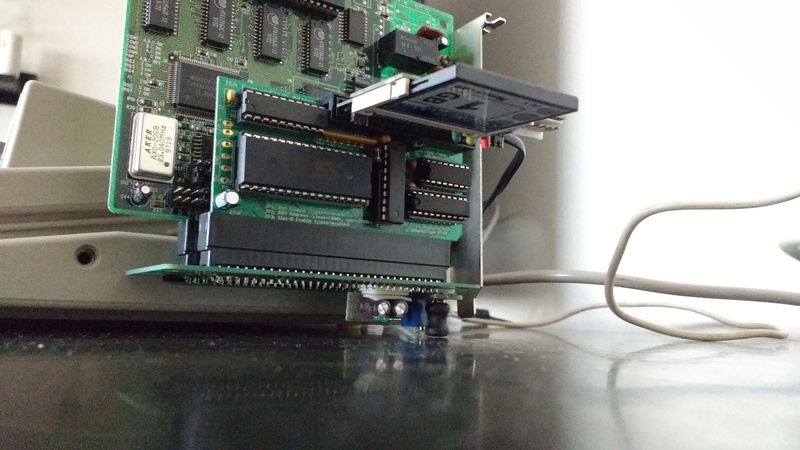 I guess Terminate is way too complex for the NEC V40 CPU. 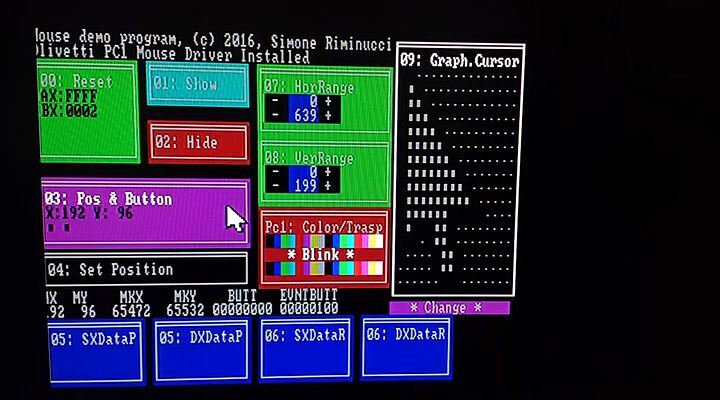 Simone Riminucci developed a mouse driver for the PC1 with a very small memory footprint. 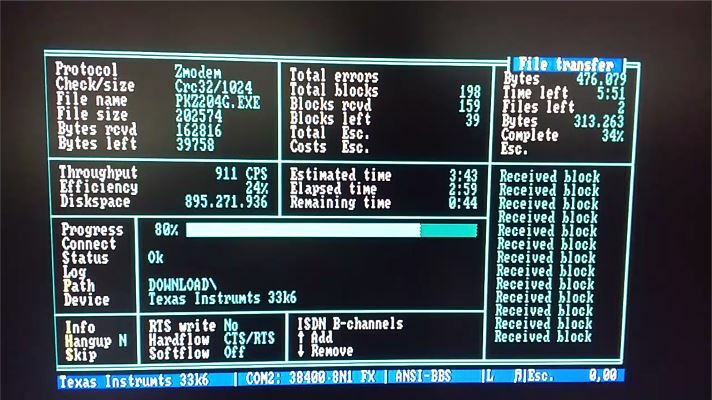 It requires only 1.92KB of RAM. It has a neat feature of displaying a graphical mouse pointer in text mode. 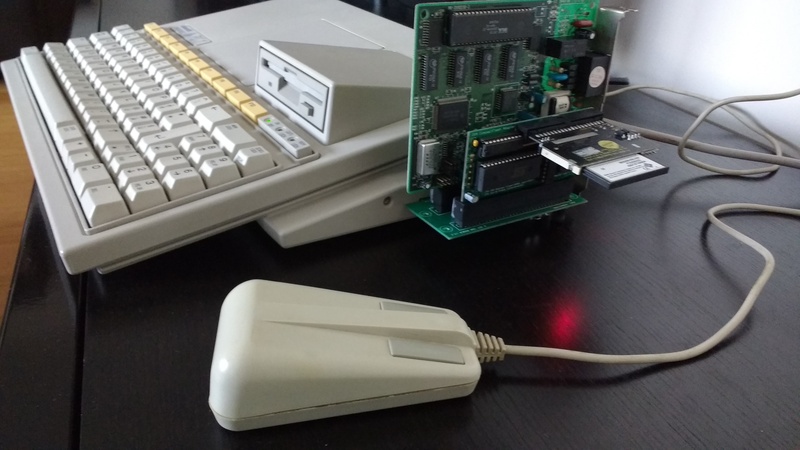 I don't have the original PC1 mouse but have an Amstrad PC1512/PC1640 mouse that works the same provided we flip some pins with an adapter. Next step will be to connect the PC1 to the Internet... and it's finally published on its own page named Internet on the PC1. Be sure to check it for information on how to do it and watch the videos.